Warwickshire spinner Sunny Singh says taking his first five-wicket haul in only his second County Championship match has made him determined to get more first-team experience. Slow left-armer Singh, 21, took 6-144 as the Bears' difficult season continued with another innings defeat - this time by Hampshire at Southampton. "I'm quite happy with my bowling," Singh told BBC Coventry & Warwickshire. "I don't want to change too much, I just want to get better and better." After making his first-class debut against Oxford MCCU in April, Singh has been given his chance in the Championship side partially through the absence of Jeetan Patel, who is with the New Zealand squad at the Champions Trophy. He bowled in tandem with Patel when he took his first wicket in the rain-affected draw against Somerset at Taunton before bowling 50 overs to claim six wickets against Hampshire. "Nothing was happening," he said. "There was a bit of turn towards the end and I started to mix it up a bit. I came on and took one, took two, then three and four - and eventually finished with six. "My ambition is just to play more regular first-team cricket now, especially with the likes of Jonathan Trott and Ian Bell who've got more experience. "Jeetan Patel is a very big help. He's a world-class bowler. He tells different things you've never heard, so I get a lot of tips." India-born Sukhjit Singh, who came to England as a 10-year-old, has been part of the set-up at Warwickshire since he was 16. A six-month stint at former Australia batsman - and current coach - Darren Lehman's cricket academy followed, which Singh described as "tough" but a "good place to go". 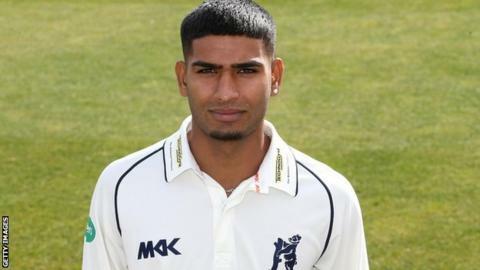 After being part of the Bears' pre-season tour to Dubai this summer, Singh played Minor Counties cricket for Staffordshire, having made his Warwickshire Second XI debut at the age of 18 in July 2014. Having so far figured in three away matches, Singh, better known as Sunny, is still to make his Bears first team-home debut. That will not happen now, at the earliest, until 26 June when the Bears host Lancashire at Edgbaston, in the inaugural round of day/night Championship games. The Bears are currently into a 17-day break without a competitive game before they take on Essex in the Championship at Chelmsford, starting on Monday 19 June. But they have two T20 games against Shropshire at Bridgnorth to help fill the gap this Friday (9 June).